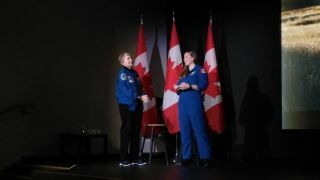 Canadian astronauts Roberta Bondar (left) and Jenni Sidey-Gibbons speak about the anniversary of Bondar's 1992 flight on Jan. 22, 2019 at a museum in Ottawa, Canada. OTTAWA, Ontario — Neurologist, astronaut, wildlife photographer, nonprofit founder, public speaker, inspirer of countless children for a generation — is there anything that Roberta Bondar can't do? Canada's first female astronaut in space made an appearance Tuesday (Jan. 22) in front of 500 wildly excited children at the Canada Science and Technology Museum here in Ottawa. The year 2019 also marks Canada's 35th anniversary of sending astronauts into space, which officially takes place in October during the anniversary of Marc Garneau's founding flight. "We have very few opportunities to put human beings in space," Bondar told Space.com. "Obviously, we want to have more opportunities for women, because there have been a lot of men who went into space and on multiple trips, and not so much for women. But I'm hoping that somebody like Jenni will go to the moon and be the first Canadian on the moon — that would be wonderful." The dual anniversaries carried weight with Sidey-Gibbons, who was hired by the Canadian Space Agency in 2017 (along with Joshua Kutryk) and is in the last year of her astronaut candidate training. Fellow Canadian astronaut Jeremy Hansen is overseeing the training schedules of the entire 2017 astronaut class, including NASA astronauts. "It's just such an interesting time to be involved in space, but beyond that, if you think about the lineage and the history of Canada as a spacefaring nation, it's incredible," Sidey-Gibbons told Space.com. "Even just speaking about it now, I get goosebumps about what space can do. And the opportunities that lie ahead of us are going to be pretty outstanding as well. I mean, commercial crew vehicles coming online, hopefully this year with crewed missions, and maybe, going back to the moon. How exciting would that be for Canada?" Bondar is once again pushing science forward at age 73, a time when many people settle for retirement. A few times a year, Bondar flies to remote areas in Kenya, Florida and other locations to document migratory bird populations. (Her foundation nicknames her #RoBIRDa on Twitter.) As Bondar takes pictures of these birds on Earth, Saint-Jacques will document their migratory paths from orbit, in a partnership overseen by the Roberta Bondar Foundation. The research program's goal is to watch the birds as they move from breeding sites, along migratory flight paths and into the regions where they hang out during the nonbreeding season. Much of those paths are under threat, as ecosystems fall prey to climate change, human construction and other issues. The pictures from ground and space will together go in a traveling exhibit that will be released sometime after Saint-Jacques' return from space later this year. Canadian astronaut David Saint-Jacques (on screen) speaks to students in Ottawa, Canada Jan. 22, 2019 from the International Space Station while in conversation with fellow astronauts Roberta Bondar (far left) and Jenni Sidey-Gibbons (center). When Bondar flew into space in 1992, the air was thick with milestones in Canada. It was the 125th year of the country's first colonies unifying into a federal state (a precursor to the modern Canada). It was year for two Canadians (Bondar and Steve MacLean) going to space. The Canadian Space Agency opened shiny new headquarters just outside of Montreal that year. Also, Canada accepted four new astronauts into its space program, including Chris Hadfield (who later commanded the International Space Station) and Julie Payette (a two-time flier who became Canada's head of state, the governor general). Bondar visited the museum here in late June 1992 to inaugurate its new Canada in Space exhibit — in fact, my parents pulled me out of school to see her. Walking through the exhibit was like seeing a who's who of how Canada got to space. It featured several models of the Canadarm robotic arm, a simulated shuttle payload bay, models of early Canadian satellites and rockets, and tons of 1990s-exciting interactive exhibits (such as rocket sites that lit up at the touch of a button). International partners were shown off, too. The 1992 exhibit included the real-life Apollo 7 spacecraft that went into space in 1968 to prepare NASA for future moon missions. (It was on loan from the Smithsonian, and since 2004 it has resided in the Frontiers of Flight Museum in Dallas.) Also of note was a huge Rand McNally Earth globe just inside the entrance to the exhibit, underneath models of spacecraft and a "Star Trek" Enterprise. There were globes like this in several museums, staff told me. Canadian astronaut David Saint-Jacques speaks live to students in Ottawa, Canada Jan. 22, 2019 from the International Space Station. At right is the view below the orbiting complex. Memories of the exhibit and the crowds in 1992 still resonated with Bondar decades later. "The idea of people greeting me when I came back from space, in the old building, was really tremendous. And now we have a new building — and new astronauts," Bondar said. You can't see the exhibit today — it was dismantled during a two-year-long museum shutdown to remove asbestos and update the exhibits — but there are still some mentions of spaceflight among the exhibits in the new building. One area celebrates the science of the very big and the very small, and includes microscopes and telescopes to show the scale of nature and how we observe it. There's also a space presence growing at another of the same organization's museum just a few minutes' drive away, at the Canada Aviation and Space Museum. Today, visitors can see a real-life Canadarm robotic arm (no humdrum, light-up models for this generation of kids), among other space-flown artifacts. In February, a new exhibit there will celebrate the role of medicine in space.